PEOPLE PLANET PLAY is an exciting new platform that connects our Corporate Responsibility programs and many of our internal brands together. It is a simple and easy way to communicate what we do and why. It creates a consistent and recognizable approach for our team members, stakeholders and guests and aligns with our Mission to inspire grown-ups to play. The fact sheet highlights Caesars' corporate citizenship performance in 2016. 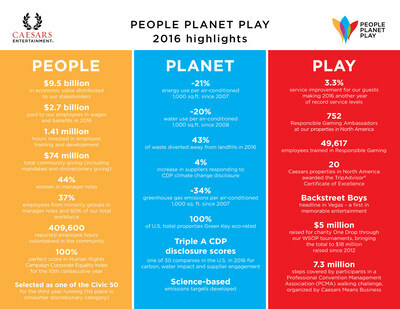 LAS VEGAS, Aug. 1, 2017 /PRNewswire/ -- Caesars Entertainment Corporation (NASDAQ: CZR) ("Caesars"), the world's most diversified gaming and entertainment company, today announced the company's eighth annual Corporate Citizenship Report, entitled "People Planet Play" which covers 2016 and select content from the first half of 2017, detailing Caesars' sustained progress and leadership across its many corporate social responsibility initiatives. "The eighth annual Citizenship Report underscores Caesars' leadership and commitment to operate responsibly," said Mark Frissora, President and CEO of Caesars Entertainment. "To us this means making a sustained, positive impact that benefits our customers, employees and the communities that host our properties. People Planet Play will help these stakeholders understand where we focus and commit resources to drive responsible fun and business practices," he added. People Planet Play is Caesars' new platform that clearly communicates citizenship at all levels of the business and reaffirms Caesars' commitment to its employees, communities, environmental excellence and Responsible Gaming. Generated $5.7 million enterprise-wide of contributed societal value for every $10 million in gross revenue, almost triple the estimated average of U.S. corporations. Caesars is recognized as the most community-minded company in the consumer discretionary industry by Civic 50, a Points of Life initiative. 46 percent of employees engaged in volunteer activity in 2016, versus the national volunteer average of 25 percent. Caesars received a perfect score of 100 percent on the 2017 Corporate Equality Index for the 10th consecutive year. 44 percent of managers are women, which is the highest ratio of women managers ever at Caesars and is significantly higher than the national average of 38 percent. Currently, 37 percent of managers are from minority groups, an increase of 3 percentage points over 2015, and 68 percent higher than the national average of 22 percent. Caesars has a target for 50 percent of manager level or higher employees to be minorities or women by 2030. "We had some true highlights in the past year, especially being recognized for the third consecutive time by the Civic 50 as one of the nation's most community minded companies," said Jan Jones Blackhurst, Executive Vice President of Public Policy and Corporate Responsibility for Caesars. "As we continue to expand into new markets, we find that our strong citizenship record is an asset that is strongly appreciated. I am inspired to keep pushing on the issues that impact us all, including gender equality, climate action and human trafficking." Employee participation in Caesars' award-winning Wellness Rewards program is more than double the average rate of that of large companies in the U.S.
92 percent of participating team members completed biometric health screening in 2016, with data showing improvement across key health risks over a six-year period. -23 percent energy reduction per air-conditioned square foot since 2007. -35 percent greenhouse gas emissions reduction per air-conditioned square foot since 2007. -19 percent water use reduction per air-conditioned square foot since 2008. 43 percent of waste diverted away from landfills in 2016. Caesars is committed to an absolute reduction of Greenhouse Gas emissions by 30 percent before 2025 and commits to a 95 percent absolute reduction by 2050 (using 2011 as a baseline). With these goals, Caesars leads the gaming entertainment industry and aligns with the small number of corporations around the world that have publicly committed to science-based targets aimed to keep the temperature rise of the planet below two degrees Celsius. Caesars established the gaming industry's first responsible gaming efforts more than 25 years ago. Today, the company has 752 Responsible Gaming Ambassadors across North American casinos. In 2016, nearly 50,000 employees took part in nearly 65,000 hours of Responsible Gaming training for employees, a 65 percent increase in training hours over 2015. Caesars has set a target for 100 percent of employees who receive Responsible Gaming training to say they feel empowered to proactively encourage responsible gaming at Caesars by 2020. Caesars is committed to providing great service with memorable experiences that inspire grown-ups to play. Invested approximately $2 billion in business development from 2014 to 2016. Caesars was the first to offer skilled-based real money gambling machines. 25 Caesars resorts and three attractions earned TripAdvisor® 2017 Certificate of Excellence. Caesars Palace and The Cromwell named as top 10 casinos in U.S. by USA Today's 10Best Readers' Choice Awards. $5 million raised for charity ONE DROP through our World Series of Poker tournaments, bringing the total to $18.5 million raised since 2012. 7.3 million steps covered by participants in a Professional Convention Management Association (PCMA) walking challenge, organized by Caesars Means Business. Caesars' core priorities were identified through a comprehensive process involving feedback from stakeholders, consultations with external experts and reviews by Caesars' Environment, Social and Governance (ESG) Council. "People Planet Play" is written in accordance with the GRI Standards 2016, core option. For more information on Caesars' Corporate Citizenship, please follow @CitizenCaesars on Twitter or Facebook and visit the Corporate Citizenship blog at www.caesarscitizenship.caesarsblogs.com. For more information on People Planet Play, please see our launch video here. Caesars Entertainment Corporation ("CEC") is the world's most diversified casino-entertainment provider and the most geographically diverse U.S. casino-entertainment company. CEC is mainly comprised of the following three entities: the majority owned operating subsidiary Caesars Entertainment Operating Company, wholly owned Caesars Entertainment Resort Properties and Caesars Growth Properties, in which we hold a variable economic interest. Since its beginning in Reno, Nevada, 79 years ago, CEC has grown through development of new resorts, expansions and acquisitions and its portfolio of subsidiaries now operate 47 casinos in 13 U.S. states and five countries. The Company's resorts operate primarily under the Caesars®, Harrah's® and Horseshoe® brand names. CEC's portfolio also includes the London Clubs International family of casinos. CEC is focused on building loyalty and value with its guests through a unique combination of great service, excellent products, unsurpassed distribution, operational excellence and technology leadership. The Company is committed to environmental sustainability and energy conservation and recognizes the importance of being a responsible steward of the environment. For more information, please visit www.caesars.com.